We looked at many pontoon boat designs before picking the right ones for our pontoon boat rentals. We decided the best vessel for touring the Destin harbor was the 2016 Sweetwater, 60 HP, 24 ft pontoon boats. These new pontoon boats are not the pontoon boats of old. They are as nice and as luxurious as just about any other boat out there. 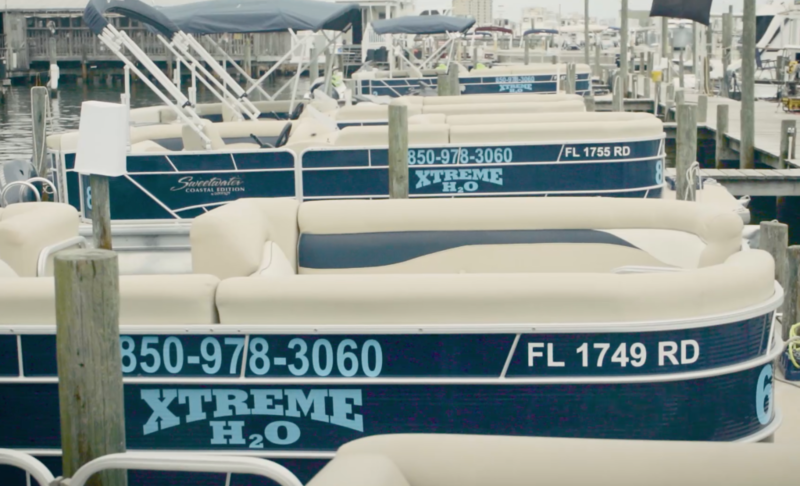 In the world of pontoon boats, it’s the fast and flashy that usually capture our attention. However, the majority of folks are wanting something a bit simpler and more cost-effective. In other words, pontoon boats like our Sweetwater 24. Some might describe our pontoon boat rentals as a “back to basics” boat. Our pontoon boat design emphasizes those things most important to the boating lifestyle. They offer uncluttered deck space and ease of operation. This makes the pontoon boat the perfect boat for renting. The standard package provides all the amenities for a day afloat on one of out pontoon boat rentals. There is seating for 12, however, we only allow this if your group contains 3 or more small children. We allow 10 people if everyone on board is an adult. We want everyone to be comfortable under the large Bimini top for shade. There is a removable table for entertaining and a bluetooth enabled sound system, so get your playlists ready! When we tested our 24 foot Sweetwaters, we reached 25 mph. The best attribute of this engine pairing is the civilized midrange performance. At 15 mph, engine noises are low enough to allow a normal conversation. You could also enjoy the sound system without maxing out the amp. This is also the sort of speed where forward motion creates a pleasant breeze rather than a buffeting headwind. That’s what makes Destin Water Fun the best pontoon boat rentals in the harbor! At Crab Island there is food, music, and fun for the whole family! Pontoon boats MUST stay inside our 13 mile radius and may NOT go into the Gulf of Mexico. Any boats found outside of our radius will be fined a $500 penalty. This is for the safety of our customers and equipment.